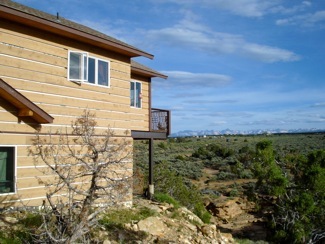 Tucked away where the canyon country meets the mountains, is a beautiful passive solar home built with two Trombe Walls. 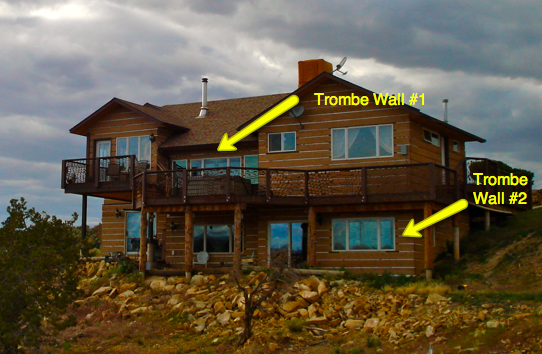 Can you guess where the Trombe walls are located in this house? People who live in passive solar homes tend to exude a certain passion and excitement about their houses. It’s as if they have a really cool treasure house that is simultaneously philosophically and economically pleasurable to live in, as it receives energy from a renewable, sustainable energy source and it saves money that would otherwise be spend on heating and cooling bills. Passive solar homes are built to harness the sun’s heat energy simply by being constructed in a certain way. 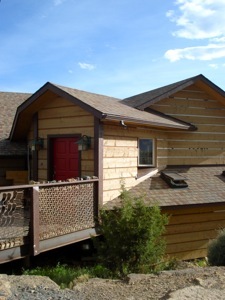 There are many variations to passive solar building. 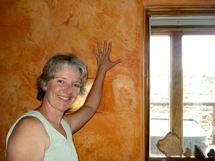 Many different materials and techniques can be used, among them, the use of a Trombe wall. Before deciding upon the use of Trombe walls, they had researched both photovoltaic (PV) solar panels as well as geothermal heat pumps. They concluded that if they built their house in an efficient passive solar manner, it would have more economic payback in a shorter amount of time than it would if they use either of the other renewable energy options. 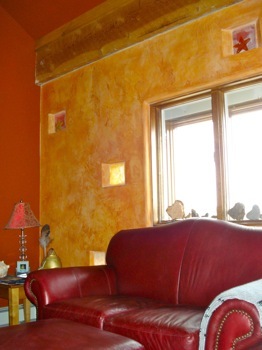 Here is one of the Trombe walls as seen from inside the living room. It is attractively finished and also glass bricks interspersed throughout it that allow more light into the room. This Trombe wall has two windows in succession. 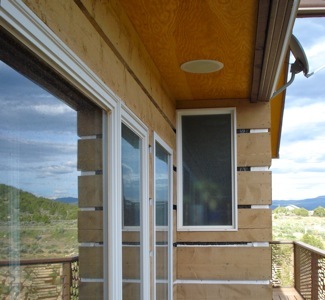 The larger outer window allows the sun’s heat to shine onto the cinder block (thermal mass) wall, while the smaller window (that is part of the Trombe wall) allows natural light into the room. A Trombe wall is an indirect method of passive solar building because the heat gain occurs outside of the main living area, indirectly warming it. In the northern hemisphere, Trombe walls are situated so that they face a southern direction to allow them to potentially absorb the winter sun’s heat energy all day. Because a Trombe wall is built with materials that have thermal mass, in the winter, the sun’s heat energy is absorbed into the wall and the heat is transferred inside to the living area. Here’s a view of one of the Trombe walls from the outside. Two feet of space separate the outer windows and the cinder block Trombe wall. It has been painted black to absorb as much heat energy as possible. 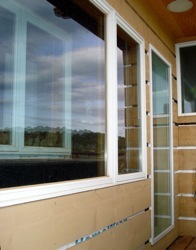 They used Low-e double paned Anderson windows. 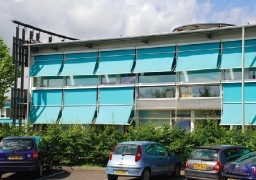 In the summer, the wall is shaded by the overhang and does not receive direct sun. When a Trombe wall is shaded, it will stay cool and its inherent qualities will absorb heat to help keep the rest of the house cooler. The density of the materials in the Trombe wall acts as a method of slow heat absorption and transfer. Objects with thermal mass can be thought of as heat batteries. In the summer, they can absorb heat from the rest of the house. In the winter, when the sun is allowed to shine on them, they can be ‘charged’ up to help to warm the house by transferring the sun’s heat inside. The thermal mass in the Trombe wall will slowly heat up as it absorbs the sun’s heat energy, then will slowly release it. In the winter, when the surrounding outside air temperature drops as the air cools after the sun has gone down, the object with thermal mass will continue to release its stored heat energy. This helps the building to stay relatively warm long after the sun has gone down. When all the heat is discharged, it is ready to once again ‘charge’ up or absorb heat again. In order for the dwelling to stay warm or cool when desired, it is important that the house be well insulated. 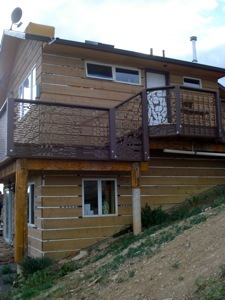 They used sheets of metal, with patterns cut out – reclaimed from the metal scrap yard as the fencing around the deck. 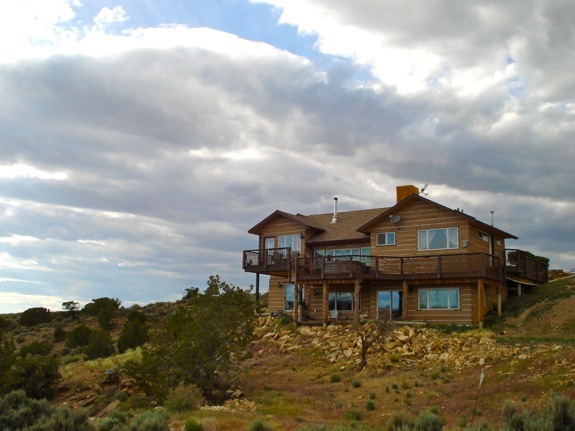 The house is bermed into the southern facing hillside. The home is very well insulated as well as bermed into the hillside. Within its base, they used insulated concrete forms (ICFs) made out of a polyurethane insulation that have an insulation rating of R-42. The railing on the deck surrounding the house are all reclaimed metal sheets found at Recla-Metals, a local metal scrap and recycling company. There are two Trombe walls in this house, one on each level. The home faces magnetic south and they have found that in the spring and fall, there is too much heat gain in the rest of the house. Where the Trombe walls are situated, however, the house, stays cool. A properly designed passive solar house will be cool in the summer and warm in the winter by passively sitting where it’s built. Did you correctly guess the location of the Trombe walls? Besides the inherent heating within their passive solar designed house, they have propane based hot water baseboard heat. The inside temperature of the house in the winter is kept at around 70 degrees Fahrenheit. They also have a wood stove and use approximately two cords of wood per winter. A 30 month average spent on propane has been $59.00 per month. No electricity is used for heating. Here’s the west side of the passive solar home. They broke ground, framed and dried-in the house from May through October 2006. After taking a break from building during the winter months, in May of 2007, they sold their old house and started a big push, working on the house from May to October 2007 and moved into the house in October. 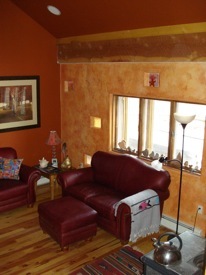 While there is some finish work still left, the house is gorgeous and comfortable. When asked about they they learned or what they would have done differently, without hesitation, both say that they wished that they would have built Trombe walls on the entire southern facing side of the house. Great article Keya. Keep up the great work. Isn’t it fascinating that a little planning, with the use of materials for the Trombe wall (or other thermal mass), window placement and orientation of the house – making sure that the windows are facing the south – can tremendously increase the efficiency of a house!?! It’s really a beautiful home. No doubt the article is helpful but I own a house in Kolkata,West Bengal, India where temperature goes up to 40 degree Celcius.I can not change my existing house abruptly so suggest me some idea how can I protect my roof from heating using the natural phenomenon of solar movement path to create shades with minimal covering or any other temporary solution which is removable. You could paint your roof white. White absorbs the least amount of heat. You could make shades for windows, or for the whole house if you get creative. You can cover it with a creeper plant. In summer leaves protect from sun, in winter it drops the leaves.